POLITICAL TIDBITS: Details of Pope John Paul II’s ‘last teaching moment,' his 'last encyclical’: his holy death on April 2, 2005, as narrated by biographer George Weigel, and lessons this newly-minted saint taught the world and the Church with his silent suffering and heroic struggle to continue papal ministry amid physical debilitation. Details of Pope John Paul II’s ‘last teaching moment,' his 'last encyclical’: his holy death on April 2, 2005, as narrated by biographer George Weigel, and lessons this newly-minted saint taught the world and the Church with his silent suffering and heroic struggle to continue papal ministry amid physical debilitation. Vatican Square where he failed to verbalize his "Urbi et Orbi" traditional message. One of the world media personalities frightfully impressed by Pope John Paul II was New York Times columnist David Brooks, who commented before JPII’s silver jubilee on the fact that the man “who had a more profound influence on more people than any other living human being” was never going to win the Nobel Peace Prize.” Time and again the Pope was bypassed by the Norwegian Nobel Committee, but Brooks considered it no big deal. As quoted by JPII biographer George Weigel, Brooks rightly opined that JPII was “too big and complex” for “what the world imagined to be one of its highest accolades.” For he asserted, “When history looks back on our era, Pope John Paul II will be recognized as the GIANT OF THE AGE, as the one individual who did the most to place…freedom at the service of the highest human goals” (emphasis BOC’s). That was JPII the Super-star. But what the world was just beginning to get a glimpse of after the Great Jubilee Year 2000--- with all the whirlwind activities JPII had initiated, as well as various world crises and internal ones hounding the Church---was the fact that the Pope had launched his own five-year struggle with mortal fallibility. After that monumental Jubilee event JPII was worn out and as Weigel pointed out in the book “The End and the Beginning,” whispers began to abound in the Vatican loggia as well as international media on what scenario awaited the end of his almost 27-year reign. Weigel noted that over decades, the Popes, especially in contemporary times, were well aware of physical dangers to themselves and they gave clear-cut orders about how the College of Cardinals was to declare the papacy vacant in the event, say, that a Pope is kidnapped, and to elect a successor right away. That scenario was clear enough and luckily hadn't happened. But what about nature working in human terms? As we saw, JPII’s successor, Benedict XVI, now 87, opted for retirement into emeritus status after eight years, owing to poor health and in order to finish the theological books he wants to write. But the ending of JPII’s pontificate was different. As Weigel stated, the Pope's physical deterioration worsened in his last five years---early signs of some difficulty in holding up his head from time to time, then as his Parkinsons’ disease worsened, occasional droolings of saliva and shaking of his hands; and the voice hitherto raised on just about every world or Church issue began to rebel against the body. When he completed his 80th year, questions were raised: was it was time to tell the Lord, as old Simeon did in the New Testament after the baby Jesus was presented to him at the temple, “Nunc dimittis”---time to let me go?” Could the Pope rule from a wheel-chair? How did the physical manifestations of deterioration of health affect the Papacy's image? Weigel related that JPII consulted his bishops dutifully and French Cardinal Jean Marie Lustiger summed up their stand for them: the Pope's was “not a request for a leave of absence or a valedictory” but how does he fulfill God’s will? They felt it was all in His hands and they encouraged JPII to carry on. Which was what he did---including undertaking critical travels abroad, such as to the World Eucharistic Congress in Guadalajara, Mexico---as his health condition improved with more care. Weigel noted that “the Stations of the Cross played an important role in Karol Wojtyla’s spiritual life for more than seventy years.” As he said, JPII in an earlier visit to Jerusalem had climbed with some effort the stone steps on the hill of Golgotha (housed inside the cavernous Church of the Holy Sepulchre) which featured the replica of the three crosses. In that visit he was ushered to the 12th Station behind the wooden partition, where pilgrims find the very hole in which the genuine Cross of Christ, where he had hung and died, was sunk. By January 30, 2005 JPII’s personal Via Crucis truly began and in the last days of March he reached his own 12th Station. Watching him suffer with Christian fortitude, a French journalist was moved to say, "This is not a pope from Poland. This is a pope from Galilee." People would line up in the streets of Rome to cheer the Pope as he passed and he seemed energized by their love. In those last weeks, as Weigel narrated, JPII bade his own goodbyes. Among those he spoke to at that last Christmas of 2004 were his kayaking and hiking buddies from his youth days in Krakow, with whom he had kept close touch all those years he was in Rome. Their long-distance call that Christmas cheered him up immensely, but no words came out of his throat. The Pope loved the tradition of leading the Stations of the Cross every Good Friday evening at the Roman Colosseum and kept it up for 25 years; but that last Good Friday, March 25, 2005 that task was delegated to Cardinal Ratzinger, while JPII watched the ceremony over TV in his private chapel and prayed along. 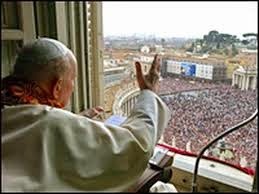 Then came that last memorable photo of him on Easter Sunday, March 27, at the papal window, striving to give the traditional “Urbi et Orbi” blessing to the world. He had practiced that message for days beforehand, detailed Weigel, but no words would come out of his lips. "The Pope "stood motionless in the window, as if frozen. He must have been overwhelmed by a combination of emotion and pain..(and) whispered, 'My voice is gone.' Then, still silent, he made the sign of the cross three times, waved to the crowd, and gestured that he wanted to withdraw. "He was deeply shaken and saddened...and seemed exhausted by this unsuccessful attempt to speak. The people in the square were full of emotion; they were applauding him and calling out his name, but he felt the whole weight of the powerlessness and suffering he had displayed. He looked into my eyes and said, "Maybe it would be better for me to die if I can't fulfill the mission that has been entrusted to me." Before I could answer, he added, 'Thy will be done...Totus Tuus," (Latin for "I'm all yours," which had been the motto of his 47 years of priestly life). At that point, the photos of Pope JPII in heroic Christian fortitude spoke more volumes than anything he might have said. Weigel narrated that by March 31 septic shock caused by a urinary tract infection set in, JPII's temperature was 104 degrees and his cardiovascular system was in collapse. At his earlier instructions he was taken to his room where from his bed he could look on images of the suffering Christ, the Black Madonna of Czestochowa and small photos of his parents. In the next hours his household staff came in to bid him goodbye and he managed to call them each by name; the day ended with a mass at his bedside where he managed to raise his hand during consecration and to strike his breast at the Agnus Dei. This was followed by the anointing of the Sacrament of the Sick and then a holy hour of reflection and prayer at his request, concluding with the household sisters singing. The following day, Friday, April 1, as Weigel narrated, JPII celebrated mass and prayed the Stations of the Cross and the hours of the Divine Office from his bed, and later, senior churchmen came to say goodbye. The Pope insisted on thanking Francesco, who was responsible for cleaning his apartment. On April 2, as Weigel detailed in his book, JPII was able to bless icon crowns that would be placed on the image of Our Lady of Czestochowa in the Vatican grotto and others to be sent to the Jasna Gora monastery in that town. Prayers were said on his behalf for the young people keeping vigil in the square outside his window, and the Gospel from St. John for that day, so aptly about the Risen Lord appearing to his apostles on that First Easter and greeting them with "Peace be with you," was read by a Polish priest. Then Sr. Tobiana, who had worked for JPII for decades, heard in the weakest of voices his last request as she leaned over at his bedside, placing her ear near his mouth: "Let me go to the Father’s house."